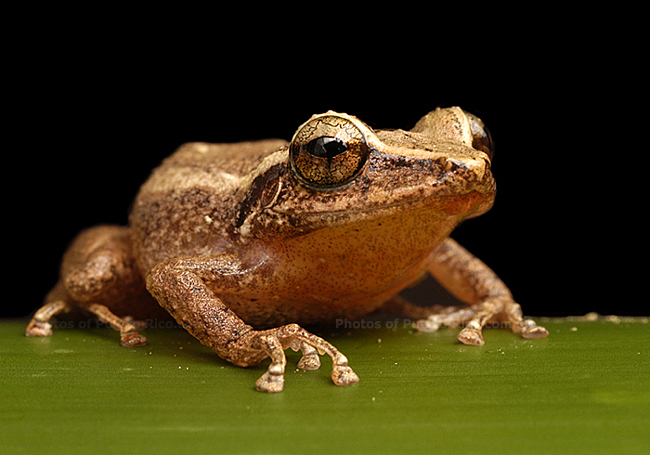 The Puerto Rican coquí is a very small - tiny - tree frog about one inch long. Some coquíes look green, some brown and some yellowish - actually they are translucent. Coquíes have a high pitched sound and can be heard from far away. The coquíes begin to sing when the sun goes down at dusk. Their melody serenades islanders to sleep. Coquíes sing all night long until dawn when they stop singing and head for the nest. Puerto Ricans love their coquíes and have written poems, stories, and Aguinaldos about them. During the time of the Taíno Indians trillions of coquíes serenated our ancestral home. Many Taíno Indian myths surround the coquí. Coquíes are found in much of the Taíno art like pictographs and pottery. In Puerto Rico all coquíes are called coquí even though not all sing ''co-quí''. Only two of the species the ''Coquí Común'' and the ''Coquí de la Montaña or Coquí Puertorriqueño'' actually sing ''co-quí''. Puerto Rican coquíes have relatives all over Latin America. The coquí genre is found in all the Caribbean Islands, and in Central and South America. But again, the only ones that make the sound ''co-quí'' are Puerto Rican. The scientific name for the coquí is Eleu-thero-dactylus, characterized because they have no webbed toes. There are 16 different species in Puerto Rico and all of them have padded discs at the end of their toes which helps them climb. Coquíes are classified as amphibians - a grouping for cold blooded vertebrates that includes frogs, toads, or newts -that are able to live in both water and land. Contrary to frogs, the coquíes do not go through a tadpole stage and break out of their egg - a small replica of their parents. Some coquíes are terrestrial some are arboreal. The Coquí Dorado is the only specie in the world that bears live young. The male coquí sings - not the female. That means that in Puerto Rico we hear only half the coquíes singing. The male coquí watches over the eggs. The eggs hatch in 28 days and the young coquíes remain in the nest for an additional 5 days. Again the male coquí watches over them until they leave the nest. When there is more light either from the moon or from street lights, there are less coquíes to be heard. Therefore there are more coquíes in isolated areas like the mountains. The specie ''Puerto Rican coquí'' sings co-quí, co-quí, co-quí at dusk and changes to co-quí-quí-quí, co-quí-quí-quí, co-quí-quí-quí, at dawn. It is arboreal - climbing to the top of trees in search of insects. There it remains until dawn when it changes its song and jumps down nesting until the evening. Coquíes are in danger of extinction and actually two of them are already extinct - the Coquí Dorado and the Coquí Palmeado. Others are endangered species like the Coquí Caoba and the Coquí de Eneida. Why are coquíes in extinction? Because of deforestation. People have destroyed their habitat or homes (nests) destroying their eggs and destroying their source of food and nourishment.